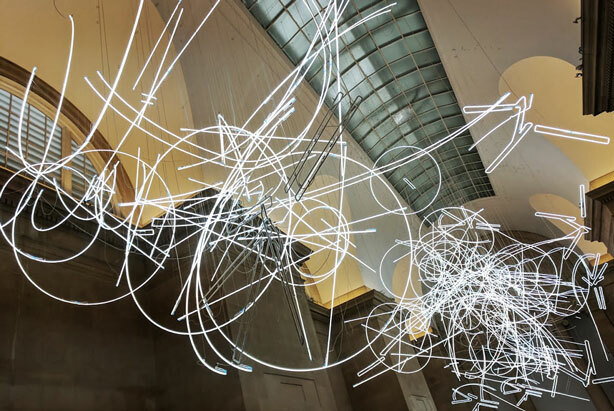 Tate Britain's Duveen Galleries installation this year is a dynamic light sculpture by Welsh artist Cerith Wyn Evans. Titled 'Forms in Space... by Light (in Time) is a dramatic, high impact and frenetic suspension of shapes. The contrast to the surrounding calm of the gallery is striking and for me this drew a lot of parallels between modern lives and the ever-growing influx of technology. 2 km of neon lighting visually arcs, spirals and leaps across the ceiling catching the attention of visitors and and inspiring many Instagram posts.